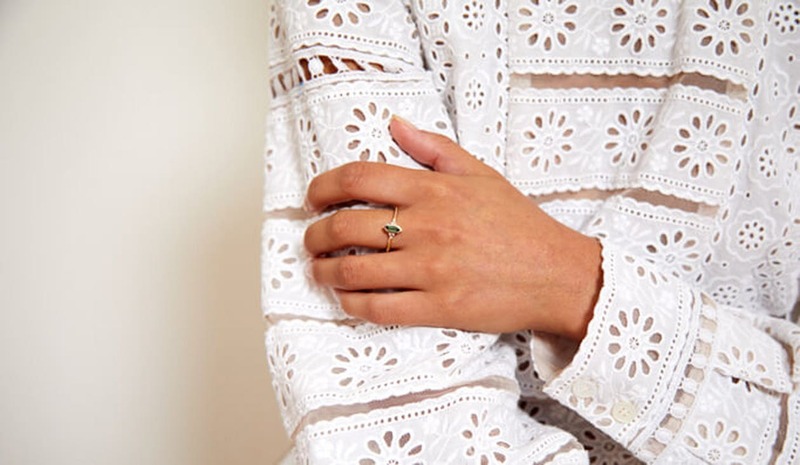 Kalani Ring / 18k Yellow Gold / Green Tourmaline is currently out of stock, however this piece can be specially hand made for you in 4-8 weeks after your online order has been completed. or 6 payments of $193 with What's this? These bespoke hand cut stones make each ring truly unique, with their own subtle shade of colour and naturally occurring inclusions. The Kalani ring features the crystal cut set in an 18k gold frame to perfectly compliment the charm of its geometrical shape. Diamonds adorn either side to create a beaded detailing effect, that sits next to the crystal cut Tourmaline. Just as the stars in the midnight sky surround the mountain peaks. The band is finished with a pointed sword edge finish with delicate beaded detailing.